This morning we kicked off Stars & Stripes week on WJZ’s Manic Monday. 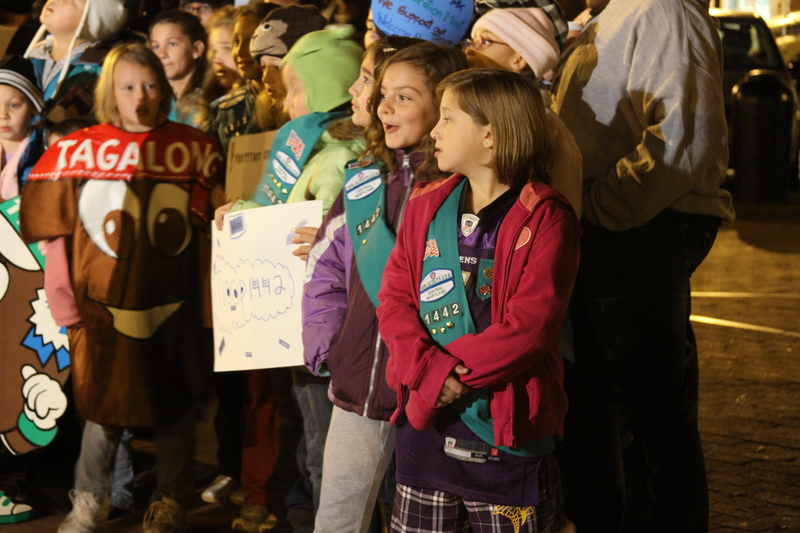 Girl Scouts from all over Central Maryland sang, cheered and waved Girl Scout Cookie signs and boxes to promote the Cookie Program and Operation U.S. Mint. During Stars & Stripes Week we are asking all Girl Scouts to promote Operation U.S. Mint at their cookie booths by asking customers to show their support for our military troops by purchasing additional boxes of cookies for our soldiers. We are also asking businesses and companies to participate by purchasing cases of cookies. Last year we collected and donated nearly 13,000 boxes of cookies for the military. We hope to top that number this year. For more information or to place an order in support of Stars & Stripes Week/ Operation US Mint, contact Terry Mercer, Product Sales Manager at tmercer@gscm.org. There are several other ways you can help support our troops and Operation U.S. Mint this week. GSCM staff is holding a toiletry drive for troops throughout the week. Drop off your travel-sized toiletries to the GSCM Urban Program & STEM Center on Seton Drive or bring them to one of the following Stars & Stripes Week events. Jerry’s Belvedere Restaurant is supporting Operation U.S. Mint by making a daily special menu item made with Girl Scout Cookies. For every dish sold, Jerry’s will donate 10% of the profits to GSCM’s Operation U.S. Mint campaign. You can sample the dishes tonight at the restaurant at 4 pm. Jerry’s Belvedere Restaurant is located at 5928 York Rd in Baltimore. On Friday, Veteran’s Day, we will host a packing party for our toiletry drive and a screening of the documentary, Lioness, which profiles five women who saw action in Iraq’s Sunni Triangle. The documentary is part of ITVS’ Women and Girls Lead series. Watch a preview and see behind the scenes footage from the documentary. The screening takes place from 12:30 pm-2:00 pm at the Seton Urban Program and STEM Center. Admission is two boxes of Girl Scout Cookies (cookies will be available for purchase) or donate eight travel-size toiletries. Bring your own lunch; drinks and popcorn are on us. RSVP to Clarke Fitzmaurice at cfitzmaurice@gscm.org by November 9. Thank you for your support of the Girl Scout Cookie Program & Operation U.S. Mint!